In the past several years, the DXing techniques of a number of us who congregate at the well-known Grayland, DXpeditioning sites have undergone a technical metamorphosis. This article covers various uses of the (laptop) computer as it relates to DXing, ranging from sunrise-sunset software to semi-automatic reception logging and direct receiver control. Grayland is located on the beaches of the open Pacific in Washington State, about equi-distant from Portland and Seattle. Those of us who gather there several times a year did not start out to become "high-tech DXers" or really to do anything except to continue to try to maximize our chances to hear rare radio stations from far away places across that huge ocean. However, as we continued to experiment with better ways of doing things and to share new techniques amongst ourselves, we each have slowly changed how we accomplish almost everything we do related to DXing in the field. Further, we have each taken many of the lessons learned at Grayland home with us and applied them to DXing from there. Lest this introduction lead you astray, let us rush to reassure you about several things. First, we each continue to DX with very individual styles of doing things. As our oldest regular member, John Bryant continues to play the role of Old Codger and DXes in the nearest fashion to the "traditional," despite sometimes using two laptops and two radios simultaneously. Don Nelson is probably at the other end of the spectrum, being the most high-tech among us. Don operates multiple sets of receivers, SE-3A's, digital audio processors and mini-disc recorders from a central laptop keyboard and multi-position data switch. Some of us have characterized Don's style as "Drift Net DXing" and wonder whether there will be any signals left over for the rest of us. So, despite now sharing a number of common high-tech techniques, we do each continue to DX quite differently. Secondly, we don't really think that we are doing anything terribly unique. Hobby articles in either the shortwave or medium wave DXing fields have documented many of the techniques that we use. Perhaps our contribution is how we individually combine those techniques to solve the unique problems of DXpeditioning. The tool that has had the most impact on our techniques, collectively, is the laptop computer. We started lugging these things to Grayland primarily to display a full suite of the marvelous animated Geoclock sunrise-sunset maps while we were DXing. After that initial experience, laptops quickly grew in usefulness to now be an essential tool for any number of DXing tasks. Our high-tech devices are not limited to laptops, however. In recent years, we have adopted hand-held Cybiko units to communicate among ourselves during a DXing session. These wireless PDA-type devices are very inexpensive, are available on the internet auction market and have maximized the group's ability to share hot tips - even between motel rooms - while never having to look up from our own dials or remove our headphones. We are also fortunate to have several "black-box" communications receivers among us and we often use the Hall-Patch developed software and an obsolete computer to drive these radios as "DX Radars." Nick's software allows us to spot potential DX targets on other frequencies, bringing them to our attention graphically, so that we may have a good idea "where to jump next" in the midst of those rare really excellent openings. This collective article was prompted by the comments of several prominent DXers from the East Coast and Europe who expressed real surprise at some of the techniques that we have begun to take for granted. The article is not intended as an in-depth text for implementing the techniques discussed. Rather, we plan to introduce readers broadly to most of the techniques that we are using and plan to provide references, where they exist, to more detailed and specific articles elsewhere for those interested in adopting a particular technique or tool. The tool that has most profoundly affected our DXing techniques is the portable computer. We are quite surprised that many senior DXers continue to believe that portable computers will add unwanted RF interference if used near communications receivers. We have found that there were very few problems of radio frequency noise being induced into receivers, lead-ins or antennas by these devices - be they palm-tops, notebooks, laptops or pen-tablet type machines. This is despite having as many as ten laptops being used simultaneously (by 5 DXers) in one large motel room. We should mention, though, that we always use impedance transformers and coaxial cable for the lead-in from our antennas. The nearest bare antenna wire is about 30 feet from the motel room. We doubt that it would have been possible to use a desk-top loop antenna very well in such an environment. Toward the end of this article, you will find several recommendations as to what kind of laptop we might suggest for DXpeditioning. At this point, you should know that most of our current Grayland machines are rather obsolete, 233 MHz or so and perform quite well when running most of the following software simultaneously. However, a couple of us have experienced some resource overload problems when running most of these programs (including ERGO) and such resource hogs as Acrobat 5, simultaneously. As previously mentioned, we began bringing laptops to Grayland primarily to view Geoclock automated sunrise/sunset maps (see below.) 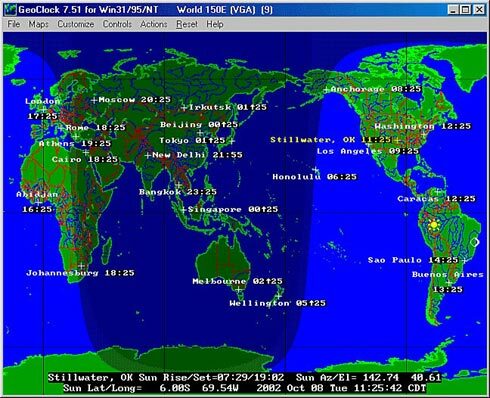 Geoclock has been the standard of the sunrise/sunset software industry for quite a long time and is well known in many DXing circles. In case you are unfamiliar with this software, Geoclock utilizes multiple maps to illustrate sunrise/sunset and twilight in real time or at any other time that the user cares to specify. If you wish to know more, we suggest that you download a shareware version and then make a paid version your first investment. Figure 1. One of several world-wide Geoclock maps in the program. Geoclock maps are clickable. Left clicks "zoom-in" by selecting ever more detailed maps from a large assortment that come with the program. Right clicks "zoom out" in the same fashion. All maps may be modified by the user to contain additional information, station locations, notes about likely frequencies, etc. Boxes showing the local time may also be attached to any location. Figure 2. One of the more detailed Geoclock maps that has been modified by SWBC DXers for DXing Papua New Guinea, Timor and eastern Indonesia. 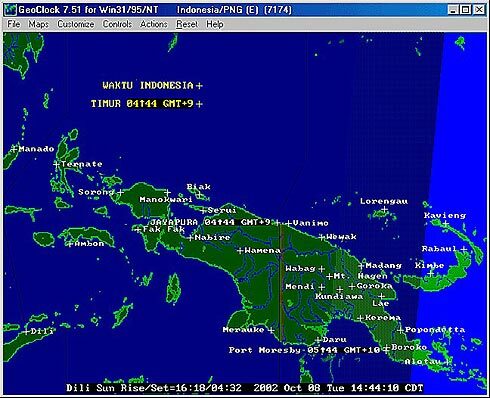 Please also note the even more DXer-friendly Geoclock map of PNG that is shown in the Receiver Control section of this article. Once you have a laptop beside your radio, it becomes second nature to use it to bring along all sorts of electronic reference material. We all bring tons of electronic references of various sorts (our current favorites are Bruce Portzer's incomparable Pacific-Asia Log for medium wave and the DSWCI Domestic Broadcasting Survey. While these electronic references have not completely replaced hard-copy documents, they have reduced the number that we must lug around significantly. As anyone who has surfed the 'Net much at all knows that there are a goodly number of references available at various DX sites as well as in various e-mail groups. Why leave that information at home??? Again, style has a great deal to do with it how one uses these e-references. John Bryant is just not happy unless he has the latest WRTH Pacific-East Asia listing clasped firmly in his left hand while MWDXing at Grayland. Some of the rest of us haven't brought WRTH along in years. B-LOG, a logging program for the rest of us! There have been automated logging programs available for radio hobbyists almost since the inception of the PC. 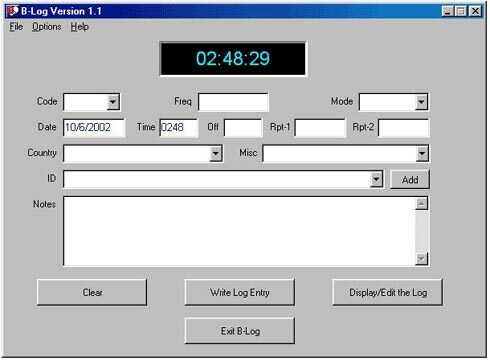 Although many of us had tried such software over the years, none of the Grayland regulars had permanently adopted logging software until about two years ago, when Guy Atkins introduced us to "B-LOG." This oddly named freeware is one of the simplest and yet most flexible logging software that any of us had seen. Besides being quite easy to use, even for two-fingered typists, B-LOG can output loggings to the Windows Clipboard (and thus to other software) in any number of formats. It comes pre-configured to output Shortwave Broadcast loggings by country and then by frequency while, almost simultaneously, outputting MW loggings in "by frequency" format. You can also design any number of customized output formats of your own. Lastly, B-LOG is searchable and sortable in many different ways. Although virtually all of the Grayland regulars now use B-LOG, again it is used in a wide variety of ways. Several of us have entirely eliminated the spiral notebook and stub pencil that have served us so well for so long. The more conservative of us still keep a rough log (and doodle) while the DX is rolling in but transfer and expand those notes in B-LOG immediately after the close of the DX session. Why? It makes reporting to the clubs and to the 'Net incredibly easy and it creates a VERY searchable long-term record log for future reference. Figure 3. The main window of B-Log is used for station data entry. Some of the more repetitive data may be entered from pull down menus. Figure 4. The second B-LOG window is used for editing and output. One can output selected loggings to the Windows Clipboard and thence to other programs (e-mail, etc) in a number of pre-defined formats or in custom formats designed by the individual DXer. Probably the biggest factor that led many of us to adopt B-LOG was its ease of use. If you, like several of us, must go months between DX sessions, B-LOG is so intuitive that - once set up - it may be used with very little secondary learning curve. We are collectively proud of this software because Guy Atkins assisted the designer in tweaking it for SWBC and MW DXing. Freeware for Win95/98, WinME, and Win2000 PC's. Should run on WinNT systems. Requires at least 800 x 600 pixel monitor resolution. UTC clock display, with time obtained from your operating system. There is no need to set your time zone with this program. Supports either mm/dd/yyyy or dd/mm/yyyy date formats, and automatically adapts to systems configured to display frequencies as either "14313.5" or "14313,5"
14 fields plus a service or activity code field let you tailor B-Log to your every logging need. The design supports multiple styles of logging in the same log file. You can attach a file, audio recording, or enter a URL for each log entry. One button click either opens the file or connects you to the URL. QSL tracking: fields are provided to record reception reports sent and QSL cards received. B-Log remembers all your Code, Mode, and Country entries. When creating a new log entry, you can either enter new data into these fields or pick from a list of your previous entries. Configurable display grid. You can adjust column widths and column ordering, tailoring your log summary perfectly to your requirements. Powerful search features and enhanced sorting make it a snap to find and organize your log data. You can sort on any column or use the four special-purpose sorts. 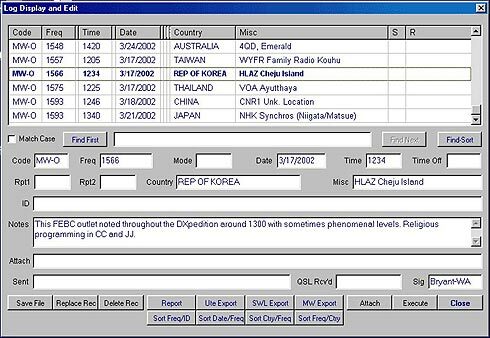 B-Log automatically generates publishable listings in the formats preferred by utility monitors, shortwave broadcast DXers, and mediumwave DXers. The listings are generated to file and to a preview screen. You can copy the formatted listings to the clipboard for effortless transfer into an email, a Usenet posting, or into your word processor. A report generator lets you export log information in just about any tabular format you prefer or require. You can save report setups. The log file is formatted as a tab-delimited text file for simple, solid export into any spreadsheet or database program. The export controls are arguably the most useful features of B-Log for the attendees of the Grayland DXpeditions. We find it greatly simplifies the process of sorting and formatting loggings for submission to club bulletins, electronic newsletters, and other publications. The UTE Export, SWL Export and MW Export formats are useful right "out of the box". If a special layout or sequence of loggings information is needed, it is a simple matter to rearrange the data and save the format for reuse in the future. 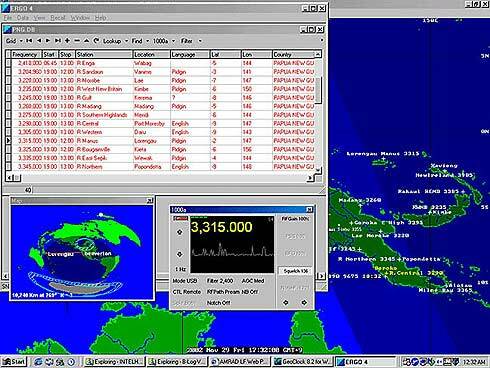 B-LOG is available as freeware from author Tom Lackamp (callsign AB9B, hence the program name). Tom also is author of Scan 320, a versatile PC-control package for the Ten-Tec RX-320. The laptop as a "tape recorder"
Second only to his primary radio, some form of tape recorder has been the DXers most prized possession throughout the modern era of the hobby. For many of the Graylanders, that began to change about five years ago when Guy Atkins introduced us to the MiniDisc format from Japan. At the time, none of these devices were sold retail in this country and we had to have them imported from Japan. That soon changed and a number of us transitioned to that re-writable digital format in the late 1990s. For the past several years, there have been a wide array of MiniDisc recorders at Grayland... from rack-mounted professional decks to tiny recorders with a footprint that is hardly larger than two commemorative postage stamps. The advantages of MiniDisc over traditional cassettes were numerous... much greater fidelity, much more compact size of both recorders and media, more permanent storage, more flexible editing, etc. Today, about half of the Grayland regulars use MiniDisc recorders. The MiniDisc format was the state of the art for the all of the Grayland crowd until about 2 years ago. Several of us began independently experimenting with recording directly on our hard drives and eliminating the need for a separate recording device altogether. Looking back on it, it seems that recording directly on hard drives had to await the availability/affordability of two pieces of hardware: relatively high capacity hard drives and on-board CD-R drives for burning CDs. We probably also waited until there was a range of recording software from which to choose. The advantages of recording directly on your hard drive are numerous, of course. For John Bryant who now travels a lot, eliminating one piece of gear (the tape recorder) to be lugged from place to place was a large motivator, as was the fact that his DXing position at home is quite small. Getting rid of the separate recording device at home gives John much needed desk space. Others of us like the fact that, with the right software, one may edit and enhance a digital DX recording with any one of more than a dozen audio editing programs. Those of us who send reception reports have, in the past, often sent cassette tapes of the reception along to the station. With our new laptop-based recording techniques, most of the hassle and extra mailing expense of that approach is eliminated by simply burning a CD of the reception and sending that along with the report in an unpadded envelope. We were originally worried that some stations, particularly in the tropical hinterlands, might not yet have CD players. John Bryant's Indonesian students assured him that even the small county stations would at least have home entertainment level CD players. They did suggest, however, that the files be burned on the CD as a "music CD" rather than as mp3 or wav data files. Happily, one of the choices in most CD burning software is "Make a Music CD." If you select that option, the software will convert your sound file to standard music CD format, automatically. Editing sound recordings on your hard drive is so easy that some of us send along two tracks: Track one is a short clip of the most intelligible portion of the reception or the ID or interval signal, etc. Track two is the full recording of the catch. There are many other advantages to recording DX directly on the hard drive. Many of us now send short clips of catches to each other afterwards via e-mail or we forward clips of unidentified stations to DXers more familiar with the language or geographical region of the probable stations. Others of us have found that assembling collections of sound clips of various catches or even arranging entire archives of DX catches is immeasurably easier when working digitally rather than with analog tapes. The one issue about using a laptop as a recorder which is still somewhat in flux is just which recording software is "best." Most of us have owned and used either Music Match Jukebox or Media Jukebox, the two recorders/players/media library managers that are the current state of the art among the on-line digital music crowd. Some of us have used one or the other of these recorders when DXing. Several of the rest of us have found those two programs just too complex and all-powerful for our tastes. Each is a wonderful program, but the learning curve (at least for the codgers among us) is quite steep and one that must be reclimbed after a DXing hiatus. The current recording software-of-choice amongst the codgers is Total Recorder. Don Nelson showed us this marvelously simple software about 18 months ago. It was perfect for the Old Codgers among us because it did everything that we, as DXers, needed and little that we did not. The main interface (see below) is arranged to emulate the symbols on a cassette tape deck and operation is quite intuitive. I don't think that anyone of us has yet to read the manual about anything except recording parameters (mp3, wav, etc.) We all started out using various iterations of Version 3 of Total Recorder, however, Version 4 has just been released and the authors have maintained its ease of use. Figure 5. Main window of Total Recorder. One of the nicest features of TR is the fact that, during playback, one can "grab" the slider bar (lower center) and reposition it to any portion of the recording. A second very nice feature is the ease at which smaller clips may be defined during playback and then saved as separate recordings in any audio format desired. An added benefit of using your computer as a "tape recorder" is that it greatly simplifies "hands off" DXing. Several of the main recording programs have subroutines that support "Timed" or "Scheduled" recordings: the ability to have the computer turn on the recording program and record whatever is present in the sound card at a specified time and then shut down at a second specified time. None of the Schedule functions that we have used is terribly difficult to program. However, again, programming Total Recorder's scheduling function is incredibly simple. Some North American DXers are using Total Recorder on a regular basis at home to record the 10 minutes at the top of the hour, each hour of the night. They then tune their receiver to a frequency of interest and let the machinery do the work. Total Recorder's design as a playback device is also particularly well suited to scanning lengthy recordings quickly. You should note that neither Total Recorder nor any of the other virtual recorders about which we know does continuous time-stamping like several of the MD recorders do. There are running indications (in minutes and seconds) of how far you are into the recording, as well as its total play-back length. 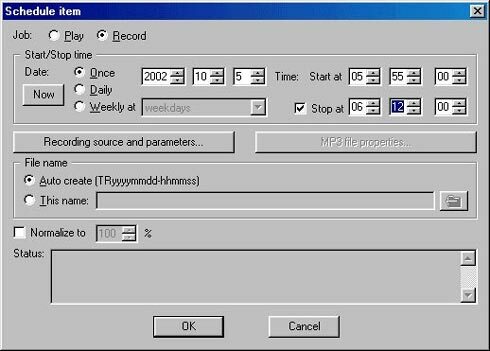 If you allow Total Recorder to save the recording automatically, the default title is the time and date of the end of the recording. The lack of absolute date-stamping does not seem to be much of a problem in practice. Figure 6. The window which is used to set-up a timed recording operation. Note that very little keyboard input is necessary. Figure 7. This window is used to manage multiple timed recording operations. No keyboard operations are required to Enable/Disable or Edit various individual timed recording sessions. The Clone function is quite useful when establishing repetitive timed recordings. It is possible to record two receivers simultaneously using the Left and Right channels on your sound card. Most mp3 compression standards have surprisingly good isolation of the two channels. Why do many announcers adopt either a rapid-fire delivery or seem to be eating marshmallows by the mouthful just in time for station identification? Wouldn't it be great if we could reach through the radio and throttle the poor announcer, telling him sternly: say that one more time; s-l-o-w-l-y and c-l-e-a-r-l-y! An easy-to-use PC & MacIntosh program out of Sweden gives us this ability, with no harm done to station personnel. Typically called music transcription software, this sort of program is known to musicians as an aid to learning music by listening to, and practicing at a slower pace. Slowing or "time-stretching" music is nothing new, but keeping the pitch from changing at the same time is a feature easily done in our digital age. The amusingly titled "Amazing Slow Downer" is a very quick to learn program which allows time-stretching (-50 to +400%) and optionally pitch variation (+/- 12 semi-tones) of any WAV or nearly any MP3 file. Figure 8. Main Panel of the "Amazing Slow Downer"
Such a wide latitude in time-stretching and pitch change is rarely needed though. The authors found that time-stretch values between 30% and 100% and pitch changes from 0.00 to 0.80 are the most commonly used. Figures in these ranges are normally sufficient to raise a DX recording's intelligibility to a level where an ID or slogan can be comprehended. The benefit to slowing down an audio clip is easily understood, but the ability to adjust pitch is equally useful. Male announcers with deep voices can be "adjusted" to a higher-pitched, "female" sounding level on an as-needed basis. Likewise, those of us who find a deeper tone more intelligible can tweak a squeaky female voice to replicate the sound of a drunken Arnold Schwartzenegger. 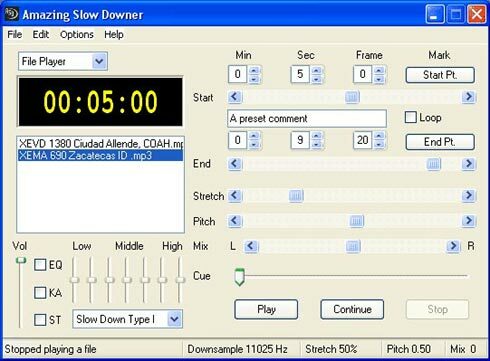 Additionally, the Amazing Slow Downer provides simple controls for marking the beginning and end points of important segments of your recording, and the ability to repeatedly loop through that segment. You can even save this marked segment to a new WAV file, complete with the time-stretching and pitch-change effects. (Saving or resaving as a MP3 requires other conversion software.) There is also a built-in 7-band graphic equalizer that's useful for a quick boost or cut of frequencies to aid in voice recognition. XEVD 1380 kHz original: Original clip with "XEVD" slightly in background, spoken by a male announcer at the 2-second mark, and concluding by 5 seconds into the recording. The Amazing Slow Downer is priced at $39.95 US, and the demo version provides a 30-day trial period with a limitation of only being able to process the first 25% of a WAV or MP3 file. When used with CD audio, the demo version will process just the first two tracks of a CD. More information is given at the author's web site, including MP3/WAV limitations, suggestions for use (music-related), and links to other programs including an older version of Amazing Slow Downer which is meant for older, slower computers. Controlling a communications receiver with a laptop computer is not new. Our collective experience began over a decade ago with the McKay-Dymek DR-333. Simple DOS programs controlled that first "black-box receiver." With one McKay-Dymek software program, the DXer could control the 333 with interactive graphics, though rather awkwardly; or one could control it entirely in an alpha-numeric environment with the keyboard by using the other operating program provided by M-D. This latter program also included an auto-logging function that would record all receiver parameters and the time automatically with the operator simply inputting station identification and miscellaneous notes. The log could then be accessed at any time (as a database) and used to retune the receiver. Since the DR-333 and these programs were developed just before the advent of the Windows platform, both DR-333 operating programs leave a lot to be desired by modern standards. In the past decade, receiver-operating programs have matured tremendously and now fall into two distinct categories. First, there are a number of operating programs that are designed for a single receiver model, by the manufacturer or by interested third parties. Secondly, there are a number of "after-market" receiver control programs that have been developed, usually by computer professionals, for sale to the hobby community. These after-market programs can usually be configured to operate any one of several modern receiver models and are often quite sophisticated, offering the operator many options and capabilities. Receiver control programs dedicated to a single receiver have been developed for all of the modern receivers which are easily controllable. Naturally, these vary widely in capability and availability. Many are available at web sites which are dedicated to that particular receiver. For instance, John Bryant recently purchased a Ten Tec RX-320 "black box receiver" to use as his second set. Although Ten Tec provides quite adequate control software with the receiver, several hobbyists have also developed their own software and made it available throughout the hobby world. After test driving the freeware programs available, John adopted GNRX320 written by German DXer Gerd Niephaus. The GNRX320 software is runs under Windows 95 and above, is very resource friendly, and allows the user to wring the last ounce of DX out of this marvelous little radio. GNRX320 also allows use of the ILG and Klingenfuss databases to auto-tune the receiver or to provide context-sensitive reference material. John is particularly pleased that the Niephaus software allows the receiver to be tuned using the mouse scroll wheel. The GNRX320 program and most of the other control programs for the RX320 are available on a dedicated RX-320 web-page. There are also quite a number of operating programs that have been developed by computer-literate hobbyists for their own particular receiver and which are not widely available to others. Some of these programs, like the one developed by our own Chuck Hutton for his Drake R-8A, are quite sophisticated. All of us have quite a bit of reference material at our fingertips while we DX - WRTH, Passport, ILG database, various inputs from clubs ranging from written material to searchable databases. Who wouldn't want to tune directly to a selected frequency listed in that mass of data and find the station there? How about checking hundreds of such frequencies rapidly? Before the advent of good software receiver control, the frequency entry buttons on my receivers were wearing and the tuning knob got a good workout. Even with the introduction of receivers with 100 or 1000 memories, the best I could do was insert the frequency but not the hours of expected operation, nor days of the week. And when I twirled the knob-landing on a station's frequency I wasn't familiar with-it took a lot of searching through all the references to find the possibilities. All of this has changed with the advent of good receiver control programs. If you have a receiver with an RS-232 port (or a CI-V port), you can link your listening with databases for tuning and identification. This section introduces one of the best, reasonably priced receiver programs available-ERGO3 and ERGO4. Since ERGO3 has been available for several years, it is the program I am most familiar with. Even so, I don't use all the features, and this discussion isn't intended to be a manual, so I'll limit my discussion to the elements of ERGO that are most helpful to me. Initializing the controls for the very first time is very easy - you'll need to enter a location name and latitude/longitude, time zone, as well as some local antenna information. (I generally ignore this, as I switch frequently between several antenna types, affecting the propagation analysis very little.) You'll need a serial cable to connect your Windows-based computer and your radio. If your computer lacks a serial port, I have found the Belden F5U103 works well as a USB to Serial port converter. Other DXers have reported problems on some other vendors' USB-Serial products. In some cases, you'll need an easily available null modem, or a serial cable configured as a null modem cable. The setup using ERGO4 is similar, except that ERGO4 can control two receivers simultaneously (but you must have two serial ports). Hint: There is an excellent radio-oriented on-line review of USB/Serial adapters. Tip: Have multiple receivers of the same type? Use a Belkin data switch between the PC and the receivers. You'll have to remember which one you are using, and may have to refresh the connection via the remote/local switch on ERGO4 or Locked/Unlocked on ERGO3. Once you open the ERGO Receiver Window on your computer screen, you'll want to set up the display options (S-Meter as bar, scope or both) as well as selecting a step size for tuning. Setting a few other options allows additional customizing to suit your taste. See Fig 1 in the upper right to see the Receiver Window configured as I like it for the WJ8712P, HF1000A and/or 8711A. Figure 9. ERGO3: Listening in to Radio Milne Bay at transmitter sunset with a good S6 signal. The upper right-hand window is Receiver Control. It gives all pertinent information on the current status of the receiver and shows (via the moving yellow line) the signal strength being received currently and over the past several minutes. The left window shows a database (ERGO's special DA3 file format) of all of the PNG SWBC stations, with information on the currently tuned station in the gray area at the top of that window. The colorful Propagation Prediction window is in the lower center with a full day shown from left to right (note the 24 UTC hours along the bottom, with the blue line at the current time.) The gray horizontal line indicates the frequency to which the receiver is tuned and the line's thickness relates to scheduled on/off-air hours. The lower edge of the yellow zone is the predicted Lowest Useable Frequency for the path from my location to Milne Bay. As you can see, the propagation prediction shows Milne Bay should be audible. A Geoclock map (separate program, not part of ERGO) of New Guinea is open in the background. Note that it has been modified (easy) to show the locations and frequencies of all SWBC stations in Papua New Guinea. Note also Geoclock indicates (by the darker areas) that the sun has already set at Alotau, Milne Bay, the location of the station currently being received. You'll also want to set up the ERGO Map Window (which allows Azimutal map from your location or Mercator, with short path shown), and the Propagation Window. Both of these are open on the bottom of Fig, 2. Again, changing frequencies on the receiver automatically resets the propagation forecast and the map. Propagation data (K, A, Solar Flux indices) can be automatically updated via the internet by ERGONET, which allows you to automatically synch the PC time to a number of time-server sites. I've found the propagation software works well- it accurately predicted within 10 minutes the time that R St Helena would fade-in locally at this site, but I note that it does not work well below 3 MHz. Note: ERGO4 setup is similar but allows up to two receivers to be setup. Note: ERGO4 reportly uses a more advanced propagation model for predictions down to 1 MHz, but this has not been verified. Tip: left clicking with the mouse on the frequency in the database will retune the receiver and update map and propagation, if open. Left clicking on the station name just updates the map and propagation without changing the receiver frequency. This is handy while listening to DX/SWL while looking for what else might be of interest. Figure 10. ERGO3: Listening in to Radio New Ireland on 3905 kHz. Note the addition of the ERGO map window - here in Azimuthal view with transmitter location (Kavieng) and the receiver location (Beaverton, Oregon) listed, and the distance between given. Location of Sun (white dot), current areas of planetary light and darkness and typical aurora belts for the current solar conditions are also shown, along with the red line which indicates the short-path propagation route of this signal. Databases are key to getting the most out of most modern receiver control programs - you can never have enough databases. I use ILG downloads, as well as custom databases from data in Mohrman's LADX page for Central and South America and a number of other more specialized databases from various sources including Cumbre Lite. Whereas ERGO3 permitted me only to have ILG and one other database active in the program at a time, ERGO4 supports opening a number of databases concurrently. Now, once I have located an interesting frequency, I can ask ERGO to FIND the frequency in the database (regrettably this works only to the exact frequency, so if you are tuned off a bit due to a varying frequency, then this does not work). Tip: Personalized databases can reflect local geographical areas of interest, say all RRI or PNG stations, or can be used to keep current target lists or even the latest tips from various online sources. You'll have to figure out a way to automate the creation of the databases (those of you skilled in PERL or RUBY will find this a breeze. C++, Visual Basic, etc would also work but take more programming effort). An alternative is manual entry, but this is much more time consuming. In ERGO3, DSI databases could be created by opening files from ILG, Fineware or by creating a custom file. I found the latter quite difficult to make work well - it's far improved in ERGO4. It is far simpler to create a DA3 file-for example, Fig 1 shows a custom DA3 file created specifically to listen to the PNG stations. An advantage to either the DA3 or the DSI database is that you can click on the frequency and it will tune the receiver (and you can use up/down arrows on the keyboard to move through frequencies). I try to keep GEOCLOCK open on my desktop with various windows of ERGO open and positioned over GEOGCLOCK map areas I'm not interested in. (Unfortunately, GEOGLOCK will not update its terminator display when in the background; it needs to be clicked and made "active" showing correct terminator position.) I'll open databases and either use them to direct-tune the receiver, as well as to tune around and then query the database. Typical ERGO3 desktops are shown in Fig 1,2 and ERGO4 in Fig 3. One of the most interesting features of ERGO4 is the ability to allow others to both control, and listen to your receiver, over the Internet. There are two great uses- the first allows you to set up a receiver (and antenna) at a remote location better suited for listening than your home shack might be. I've not yet done this, but having a receiver down at the Coast appeals greatly. Running a more stable operating system would be an advantage (I use both Red Hat Linux and Win98/XP on my systems, but ERGO only runs on Windows platforms. In the future, I foresee DXpeditioning from the comfort of ones own home using remote receivers and antennas, shared with friends across the Internet (not supported yet by ERGO). A second good use of ERGO is to allow the software vendor to debug a problem remotely from his home but on your receiver and system - ERGO author John Fallows did this with several of our receivers during the beta testing of ERGO4. ERGO4 offers audio recording, DSP filtering, and built-in logbook feature (similar to B-Log) albeit with a greater learning curve. * You can Profile or Scan continuously on Radio 2 and tune Radio 1 from the graphs. * The Parameters for Scanning are very flexible, including gaze time, dwell time, dead time and signal threshold. John Fallows plans to further augment ERGO4 with a capability quite similar to the Hall-Patch "DX Radar" discussed elsewhere in this article. John Fallows takes suggestions for improvements seriously - he's done remarkably well with improvements on the new ERGO4 through the Beta testing process. Yet, according to John, his work on improving future versions of ERGO4 will remain ongoing - there is more to be accomplished. Don't expect ERGO to look like the front panel of your receiver. With support of so many receivers, it wasn't possible to do this. Also, there are features of some receivers that aren't fully supported - for example on the WJ8712P the noise blanker has more controls than are typically accessible from the 8711A/HF1000A. Users of ERGO4 will likely miss the prominent display of the current time and date that was highly visible in the ERGO3 Receiver Window. I know I do. All in all, I feel that the ERGO software is the most powerful and comprehensive receiver control package currently available to the radio hobby community. Like all powerful software, there is a learning curve to go through as you become familiar with the software. However, the ERGO user is rewarded with an incredibly nimble receiver control and the ability to orchestrate a large amount of reference data and real time information in support of high-tech DXing. Note: ERGO3 supports AOR7030, NRD535/D, HF1000A/8711A/8712P,RX320, R8A/B. ERGO4 supports all of these plus RX340, R75, RX350,and NRD545. Currently in beta & alpha tests are software drivers for the R8500, RX331, NRD-525, JST-245, TS-570, TS-870, TS2000, RA6790, R8, and HF-2050. Finally, I'd like to thank John Fallows for his continued efforts on this labor of love. The price for this software isn't cheap but revenue does little to compensate for the total cost of the software in terms of the numbers of hours he and the beta testers have put into ERGO3 and ERGO4. There are a number of other computer applications that we have or could invoke through our laptops while on DXpedition, and most are probably obvious to the reader. Several of us prepare reception reports during the hours that aren't DXable, including both the text report and burning a CD of the reception itself. Very occasionally, we have DXpeditioned with access to the Internet. That capability opens up many possibilities, of course, from background research and communication with other hobbyists to actually matching program content of a reception (while it is occurring) with audio from the 'Net which is being streamed "live" by the station. Four years ago, no one lugged a laptop to Grayland, now some participants bring two or three! One of the most difficult aspects of DXpeditioning, particularly if the group is larger than two DXers, is finding a means to communicate hot DX tips to each other without either disturbing people in the next motel room or continually having to pull out headphones off in the middle of a catch and say rather grumpily "What did you say???" With seven or eight DXers at a typical Grayland DXpedition, this became a difficult problem, especially if we are scattered in two or more rooms. For years, we tried some version of passing around written notes, but that really never worked. Then we scrawled things in our logs and held them up for other people to read. That worked, sometimes, but rather poorly. It is hard to decipher a hasty pencil scrawl from across the room. We day-dreamed for years about a computer-based LAN network, but the expense was a problem as well as forcing everyone to bring a computer capable of attaching to a LAN. Now, of course, there are possibilities of wireless networking our laptops, but again, expense and compatibility issues abound. We needed to find a mechanism that would be both inexpensive and inclusive of everyone on the DXpedition. Guy Atkins led our search, but we all pitched in with various ideas. Our next idea was using hand-held "white-board" chalkboards and broad water-based markers. The boards were about 10" x 15" and a brief note written in marker was easily legible from across the room. The boards and markers were under $7.00 per DXer and hence, very affordable. They worked wonderfully, as long as everyone was in the same room. Unfortunately, the second time that we used them, there were enough DXers present to require two rooms. We found, of course, that it was next to impossible to tear yourself away from a super catch to walk even a few steps to show a note to the troops in the other room. And, also of course, on the second morning, the DXers in the back room stumbled on to the catch of the DXpedition, a brief opening to coastal New Guinea on MW. The troops in the front room heard about that catch at breakfast... after the band had faded out. Obviously, the white-boards had to go! Well prior to our next DXpedition, super-shopper Guy Atkins discovered CYBIKO hand-held PDA units from Asia and the problem was solved. Cybiko were developed originally for the East Asian youth market where they were briefly "all the rage." Although these units can perform most of the functions of normal "PDAs, their most attractive aspect was that each Cybiko unit can communicate wirelessly, in text form, with other Cybiko units. They can communicate with all other units (up to 100) within their 150 foot range or they can address individual units, with no one else receiving the message. At the time that we adopted these units (early 2001) they were selling for about $20.00 each, new-in-the-box on ebay. Today, there are two different models of Cybiki available: the so-called Cybiki Classic that we adopted and the newer Cybiko XTREME. These two units are excellent as DXpeditioning tools. One of the handiest aspects of the Cybiki are the fact that each unit can be set to vibrate briefly when it receives a message. We usually just leave them sitting on our DXing desks and, when a message arrives, we are able to feel the vibrations through the table. That way, we can pay maximum attention to our own DXing, but never miss a message. Messages must be typed into original Cybiko Classic with a small pencil-like stylus. 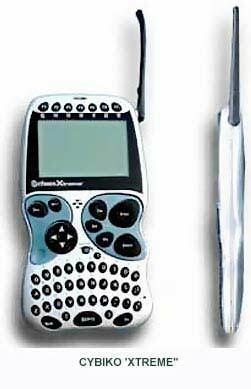 We understand that the button placement on the Cybiko Xtreme is such that one can type with a careful finger. Chuck Hutton recently purchased an Xtreme model and has tested the communications between Classics and Xtremes. It works fine! As you might guess, we have all learned to abbreviate our messages. 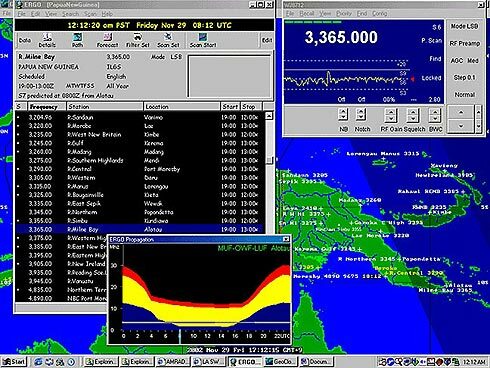 The Cybiko unit (and DX Radar) was directly responsible for our first-ever reception of Indonesia on MW from Grayland. Not only had Nick been able to alert every one, but Don and Guy, as long-time DXers of Indonesia were able to recognize the language with great confidence. All that was accomplished without any of us having to take our headphones off or even look up, EXCELLENT! The easiest method of obtaining Cybiko units right now is through the ebay auction site on the internet. Both models are still available in late 2002, with the obsolescent Classic units selling for $12 to $15, new in the box and the Xtreme units going for from $25 to $40, new in the box. DXers have probably dreamed about some form of what we have come to call "DX Radar" just about as long as there have been DXers. The wide spectrum graphic spectrum analyzers of the tube era were one attempt at a method of representing the signals present on a given band. Unfortunately, sweep speeds were slow and resolution poor, so little hobby application was found for these early efforts. Its almost certain, of course, that the various electronic intelligence agencies of the major powers developed such gear to a relatively high level of sophistication. To our knowledge, though, little if any of this gear has made it to the hobby world. In the late 1980s, several sophisticated receivers did appear on the civilian market that offered spectrum scanning capabilities. We have had experience with only one of these rigs, the McKay-Dymek DR-333. In addition to its graphic and text-oriented operating programs, it offered operators a spectrum scanning function. This module allowed the operator to define the upper and lower limits of the spectrum to be scanned; the receiver then divided that spectrum into an arbitrary number of steps and checked for signal strength at each of those step. Since the DR-333 was a black-box receiver, it output the results graphically, to the computer screen. This approach was similar to that found on several other high-end receivers and worked moderately well when monitoring a sparsely populated band such as 90 meters. However, its usefulness was much reduced on more populated shortwave bands and it proved useless to monitor for unusual signals on the crowded medium wave band. "DX Radar" is a DOS-based receiver control program, implemented presently for the Dymek DR-333, Ten-Tec RX-320 and for a highly modified JRC NRD-525. Every 100 milliseconds (250 ms in the case of the RX-320), the program tunes the receiver to a different preset frequency and records in memory the signal strength found there. After averaging a few of these signal strengths for each channel, the resulting signal strength is displayed on the PC screen for each channel after using a simple algorithm described below to (partially) remove the effects of the domestic sideband splatter usually found on MW DX channels. These preset frequencies are usually 9 kHz-spaced overseas MW channels, plus a frequency 1 kHz away from each 9 kHz channel. The latter signal is far enough away from the desired frequency so that any DX signal is out of the filter passband, but near enough to have quite similar splatter characteristics. The noise signal level is subtracted from the DX channel's signal level, and the resultant value gives a rough idea of DX activity on the desired channel. Unfortunately, it takes 20 seconds to do one scan of the MW band using this method, and averaging of a number of scans is desirable to get better signal strength accuracy, so the update rate is usually set at about 2 minutes. A DX signal can fade away in that period of time, but until a PC-controllable receiver is found with a fast enough AGC decay to be scanned more quickly than every 100 milliseconds, it's a problem we'll have to live with. Figure 14. A fairly typical "low band" opening to East Asia from Grayland at dawn as seen on DX Radar. The figure above represents a fairly typical opening to East Asia from the Grayland site as seen on the Hall-Patch DX Radar. The chevons (>) represent the signal strength that was present on that particular channel as the Radar swept past it. A single chevron represents the default signal strength of very little to no signal on the frequency. Experience has shown us that two chevrons (>>) indicate a het of medium strength or maybe "threshold" audio is present. Channels which show signal strength of three chevrons (>>>) almost certainly have "listenable" audio present, while four chevrons usually indicate "arm chair copy." How one responds to a DX Radar display like the one above is largely dependant on the level of personal experience with Trans-Pacific signals from the Pacific Northwest. A neophyte would certainly first choose to log the arm-chair level signals indicated on 594, 828 and 1053 kHz. He will discover that 594 is JOAK, NHK's First Program from Tokyo; 828 almost certainly will be JOBB, NHK's Second Program from Osaka and he will discover to his chagrin that 1053 is a South Korean "bubble" jammer covering a North Korean propaganda station. A DXer who is more experienced at TP work (and knowing that it is an East Asian Opening) will recognize those signals from the Radar Screen and will also note the presence of the other usual strong NHK-2 stations on 747, 774 and probably 873. Further, the experienced DXer will assume that 954 is JOKR, Tokyo, that 972 is HLCA, the KBS outlet from Dangjin, South Korea and that it is likely that the two high band stations, 1287 and 1566 are JOHR, Sapporo and HLAZ, the giant missionary station on Cheju Island, South Korea, respectively. These stations are the most reliable performers, year-in and year-out from East Asia to the Pacific Northwest. With those channels eliminated from consideration, the experienced TP DXer will likely focus first on the other three frequencies that are showing three chevron strength and are almost certainly in audio. The possibilities for 576 include Russia, Laos, Malaysia, Myanmar and (heart-a-fluttering) India, as well as smaller scale stations in Japan and throughout East Asia. The 837 chevrons indicates a signal that is "probably" South Korea, but might be India or maybe one of the smaller scale Japanese NHK 1 outlets. Finally, the 1035 signal is most likely China National Radio's First Program from near Beijing. Most of us would try to check all three signals, but we would likely start with 576 kHz. As far as international medium wave DXing is concerned, it must be said that DX Radar is an imperfect tool. It seems to be more useful some mornings than others and, at times, will indicate "false positives" despite Nick's nifty routine to minimize splatter from adjacent channels. At the worst, DX Radar can give us an indication of the part of the band that is the most active and thus make our manual scanning much more effective. Since the DX Radar has not become well known in SWBC DXing circles, no one has tested it on the shortwave bands. Those of us with experience on those bands think that it would be quite effective on 60 and 90 meters where most signals of interest are relatively QRM free and their presence is only limited by propagation and time of day. 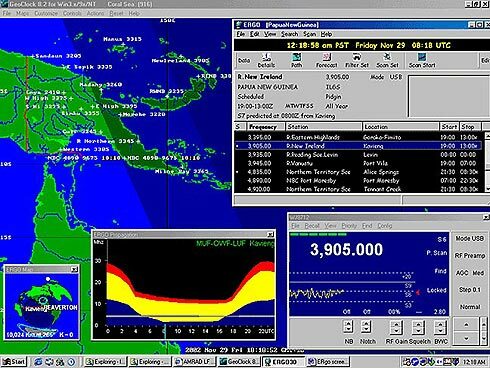 For instance, DXing the SWBC stations in Papua New Guinea at dawn would be made immeasurably easier using a version of DX Radar with each of the PNG channels in the scanning file. With only 20 or so relatively QRM free signals to monitor, the DX Radar would update itself much more quickly and ought to be a near-perfect predictor of a stations presence and signal strength. Finally, it must be stressed that we have found that DX Radar will not run well in a "DOS Window." A computer Running Windows 98SE or earlier can be rebooted into DOS from the "Restart in DOS" selection on the Shut Down menu. The rather small DOS program for DX Radar may then be executed from the command line. We have found it easiest to simply dedicate an obsolete computer to the DX Radar function. Nick, himself, uses an old 386 tablet "Grid" computer and John uses a mini-notebook 486 machine called a Compaq Aero Contura that currently sells on the web for well under $100. With newer computers, establishing a partition of DOS-only programming and making the machine "dual bootable" is probably a good strategy. If you have yet to acquire a laptop for DXpeditioning use, we should state again that most of the machines that we use at Grayland are quite obsolete (and therefore very affordable.) Most of the software that we use could actually run on a 486 machine, but in truth, more than half of our machines are in the 250 MHz. Pentium class of computers or better. These are currently available on ebay and elsewhere for well under $300. We would recommend buying a laptop that has at least 4 GB of storage space and which supports USB or at least PCMCIA connected devices. These latter allow rapid sharing of software and files between machines - an attribute that we find handy when loading our machines at home and when sharing among ourselves here. Collectively, we are in disagreement as to just what level of machine to recommend. John is quite happy with one of the now-$300 machines mentioned above. You should know, however, that he does not intend to use ERGO or one of the other resource-intensive receiver tuning programs. However, he does regularly use Geoclock, a couple of Adobe PDF references, B-log and Total Recorder and a simple receiver control program for the Ten Tec RX-320, all simultaneously. Nick, on the other hand, points out that, if you run all of the above PLUS a sophisticated receiver control program and maybe another resource hog or two, it is possible to saturate even a much better machine than John's. He puts more emphasis on the fact that the current whiz-bang units which are going for $1.5k+ today will be garage sale specials in a couple of years, and will do a nice job at the DXpedition site. Guy has done fine with his 266 MHz machine running Geoclock, ERGO, B-Log and some open ASCII text references, but loading the PAL with Acrobat 5 caused a marked speed decrease. He had to drop back to Acrobat 4 like Nick suggested. Guy says that he has been surprised, actually, at how well this modest notebook works for him. Perhaps the 92MB ram helps, but its likely that Windows resources is a key item. "Any day now" Guy's dropping in a new CPU card (MMC-1) that he got through Ebay, but it's only a minor bump to 300 MHz. Guy also muttered "Maybe I can convince Rochelle we can do a notebook upgrade along with the new furniture." Fat chance. Any laptop that you are considering for DXpeditioning use should have a serial port, especially as the USB to serial converters aren't always very effective. A serial port is absolutely required in all current receiver control applications and even if you don't intend to go that route at all, a new inexpensive digital receiver like the Ten Tec RX-320 may come along and change your mind. If you are to do any kind of audio work with your DX-capable laptop, and a Line-In or Mike-In audio jack (in stereo, if possible) is absolutely essential. Stereo input capability is recommended because many of us have found that we would like to record from two receivers simultaneously. This is possible with Total Recorder and similar software, but only if your audio-input capability is in stereo. Unfortunately, many "modern" laptops come without either Serial ports or provisions for inputting audio signals. If one is already intending to purchase a new laptop for general use anyway, one might as well get one that will also serve as a high-tech DXing machine. On the other hand, if your only reason for purchasing a laptop is for DXpeditioning use, the best route might be to try out one of those $300 Ebay specials for a year or so and then you'll have a good idea as to just what level of machine you need long term for DXpeditions. The reason that this article is titled "Emerging Techniques..." is that this is, at best, an interim report of what one group of DXers is doing with several very rapidly changing technologies. As such, this article is practically obsolete before it is published. We do hope that some elements of our recent efforts will prove useful to many readers. We also hope that this article will stimulate others who are applying new tools of technology to DXing to write similar articles for the hobby press.